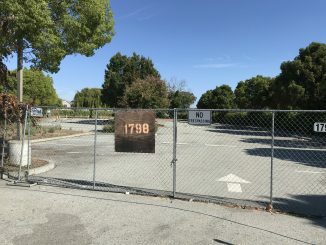 RVs that have been parking on the streets of East Palo Alto at night will get to park in this lot at 1798 Bay Road soon. Post photo. 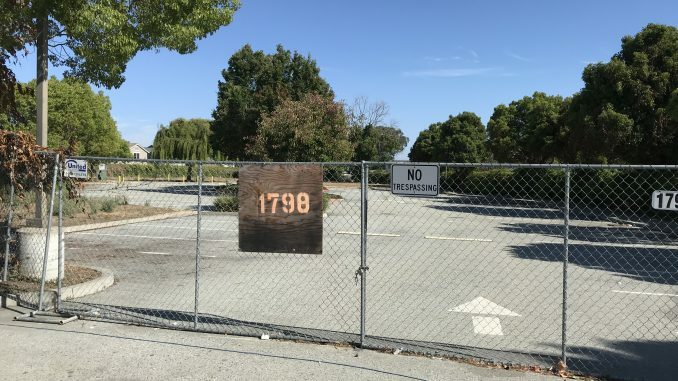 East Palo Alto’s City Council has unanimously approved the idea of allowing RVs to park on a city owned lot on Bay Road, but the place won’t be opening until November. About 30 RVs park on the city’s streets every night because of the housing crisis that has forced people out of their homes. The council approved plans and funding for the RV park at its meeting Tuesday. The vote was 4-0 with Mayor Ruben Abrica absent. The city is turning to the nonprofit Project WeHope to run the park on city land at 1798 Bay Road near Clarke Street. At Tuesday’s meeting, all 15 people who spoke said they were in favor of the RV park, though some people were concerned that the city would be dipping into business tax funds to pay the $318,500 to get the RV park started. The business tax, which was approved by voters as Measure O in 2016, was supposed to be for assistance of renters, not to be used for an RV park, a number of speakers said. 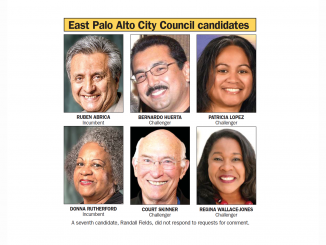 “This (program) is overdue and I’m in support of it, but I’m worried about the allocation of Measure O funds,” said resident Ofelia Baio, who suggested that some of the money for the program come from Measure O funds and the rest from the city’s surplus. Councilman Carlos Romero asked City Manager Carlos Martinez if the city had any other money it could use for the RV park. Martinez said that the city had a surplus of approximately $3 million in the fiscal year that ended on June 30. Romero proposed that $118,000 of the $318,000 price tag come out of the general fund, given the surplus. The rest of council agreed. The money will pay for such things as water and sewer connections to Project WeHope’s van that will provide showers, laundry machines and a bathroom. It will also pay for new fencing, a small check-in kiosk, Porta Potties and re-establishing electrical service to the site. The site won’t open until November, however, because it still needs to go through the planning commission to get a use permit. Also, council will consider an overnight street parking ban before the RV program starts. a question for counsel : how does this end? i don’t see any time limit as to how long this lot will house RVs ??? is this forever, or will the city of epa ever get its land back to use for something else??? once homeless people take over something, it’s hard to get it back … activists move in, the media does sob stories … politicians chicken out. Will this be free for the people in the RVs? I think able bodied people should work if they get welfare, and that’s what this is. So charge them rent!